Below: A sarcastic email between Baby Boomer and Millennial generations in response to the latest Pew Research Center report. Disclaimer: Both parties enjoy hearty debate of generational and political differences. May be mildly offensive to some readers. You take down the economy. I take down religion. We're even. The latest pew survey has poured a heap of data on our religion's doorstep with a damning decline in the number of Americans identifying with the Christian faith. In fact, we see in this report the sharpest decline in statistical memory. The Pew results leaves a wide berth for speculation in where this downward facing dog trend is taking the next generation of United States inhabitants. And, alas, the blame is laid primarily on the shoulders of the Millennials. 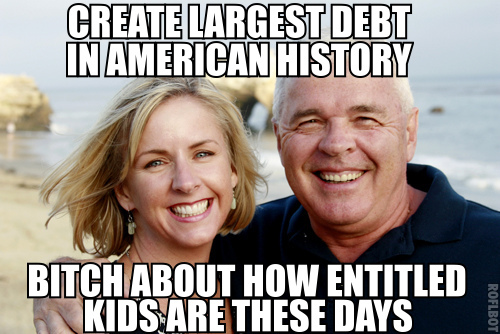 Why is that (according to Pew Research)? More likely to “switch” from Christianity to another faith or unaffiliated. For every 1 person raised unaffiliated then switches to Christianity, 4 Millennials raised in a Christian church leave. 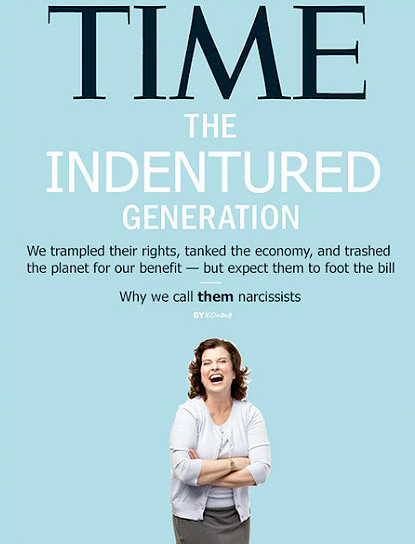 Oh yes, let's not forget that not-so-statistical specter of the 2013 Time article titled: The Me Me Me Generation: Millennials are lazy, entitled narcissists who still live with their parents. Why they'll save us all. (For more details, check out The Article) Since that article's publication, I have been called by more than one Baby Boomer “lazy and entitled”--probably narcissistic too if I cared to continue listening. And I will admit more than one of these name calling events occurred while I was working a minimum wage job with a Masters degree and living with my parents (because who can afford rent when you make $8/hr?). The Pew Research Center may have the statistics to point a finger at Millennials, BUT, the report also mentions the 8 point drop in religious affiliation among US population also reflects a decline in religious association among Gen Xers and Baby Boomers. Let's keep this in mind while proceeding forward. The statistics show one point loud and clear: 8 in 10 adults who now identify as “non-affiliated” were raised in a religion. 28% of those 8 were raised Catholic and 21% were raised Protestant—equaling 49% of those now non-affiliated with a Christian background. A recent NY Times article suggests one reason for the high rate in decline is the intertwining of Christianity with political agendas—especially radical conservatives like the Tea Party and Presidential platforms harkening to sensitive religious rhetoric on marriage and abortion. There is certain validity if you remember attending that last political rally where protesters felt the need to hold signs like “God hates X” or “Jesus was a Socialist”. We both can admit to encountering someone who makes us cringe with so called “religious” politics. But, that hasn't moved generations away from religion like we see in the latest Pew Research report. What I see in the length of Pew statistics is clear departure from claiming tradition for its own sake. As an example, Millennials believe it is more important to be a good parent than have a successful marriage or living a religious life. The idea of being a good parent is no longer linked to a religious life. I'll leave you to wonder at this list of priorities, but think about our witty relationship's transcending quality. Your convictions about women in religion would mute our fun. I would further add the rise of social media and increased access to technology exposes individuals to a greater diversity of perspectives about God and the universe. The mobility of our social encounters in time and digital space logically suggests more “switching” is going to occur among adults who never quite understood why their faith couldn't fully resonate in their life journey. Or maybe it isn't that complicated? My cynical nature shrugs, 'Finally people have stopped lying on those surveys.' The decline in religious identification is simply an ownership of a lack of participation in what churches and religion mean today. History also tells us two things—inflexible social structures are murdered by its members and religions tied to political rule only last a dynasty (think Rome, Egypt, or Athens). Tradition must live and grow with its practitioners. The first debates of Jesus' followers (post ascension) in the New Testament about circumcision outline this premise: we cannot be afraid to break a religious practice for the sake of Jesus' more important message. God is love and we are invited to share in it. If we, as those who choose to identify as Christian, are afraid of the latest Pew results, then perhaps we need closer introspection of our motives. Why do we want people in the pews? Financial stability? Social standing? Counting faith decisions? I suggest to you the latest Pew results are not pointing to the death of the Christian religion, but a reclaiming of Christian faith for a 21st century world. ...Memes included. My condolences to the end of an era of Christian superiority and obligation. Let's make this era one of authentic relevance--reminiscent of that homeless guy 2000 years ago who ate dinner with shamed prostitutes and despised government officials, who washed fishermen's feet, and wept for the death of his friend.